About three months ago, I received an email from a young girl I don’t know who lives somewhere in my neighborhood. 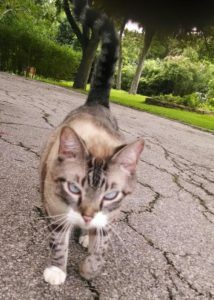 The subject line read: Lost Cat. I could tell by all the email addresses listed that she had sent it to everyone in our Homeowners Association. It was a simple plea for help to all the neighbors. Chloe, her beloved eleven year old, longhaired gray cat was lost. The email said she was a very timid, indoor cat. She somehow got outside and couldn’t be found anywhere. We were asked to please keep an eye out for Chloe in the neighborhood. I sensed this young girl’s panic and worry over Chloe’s welfare and safety. I know how the mind imagines all kinds of scenarios when a pet is missing. I immediately answered the email and said I would be on the lookout for Chloe, and that I would pray that she would be safely found soon. In the days, weeks, and months that followed, I often thought of this little girl giving up and losing hope of ever finding her beloved cat. Each time I thought of the young girl, I said a little prayer that God would comfort her in her loss. As time went by, I knew the chances of Chloe being found became less and less. Then, last week I received another email that said, “I wanted to let you all know Chloe was found!! !” She went on to say that Chloe was found barely alive on a golf course miles away. With the contact information on her collar, Chloe’s family was notified, and she was rushed to the veterinarian. She is recovering from heat stroke and dehydration, and may need a blood transfusion, but they are so grateful she is home after being lost for two months. It was a reminder to me of the times when I have given up on something or someone, or I lost hope that circumstances would change or that people would change. There were times in my darkest hours when I was ready to give up ever finding joy again and felt hope slip away with the reality of death and loss. You might feel lost and alone, ready to give up on something or someone—even yourself. You might be on the brink of losing all hope that your circumstances will ever change or the people you love will ever change. Perhaps you feel like nobody will ever find you and rescue you from the pit of despair. 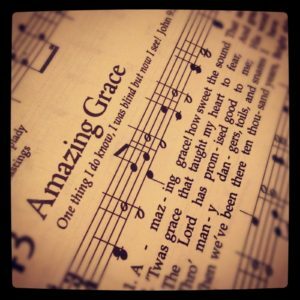 Read aloud these words from the classic hymn, “Amazing Grace,” written by John Newton in 1779. Never give up. Never lose hope. Run to God right now. Pour out your heart to Him. Let the tears come. You were lost, but now you’re found. Let His amazing grace lead you home to Him.